« vEco’s Ian Redmond receives RSPCA-Daily Mirror “Animal Hero” award! Welcome to our new virtual Gorilla safari, launched to coincide with the first ever #WorldGorillaDay. 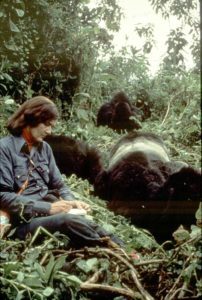 September 24th 2017 has been designated the inaugural World Gorilla Day by the Dian Fossey Gorilla Fund International, to celebrate the 50th Anniversary of Dian Fossey establishing the Karisoke Research Centre on this day in 1967. Click HERE or on either of the two images from Karisoke to begin your virtual tour. 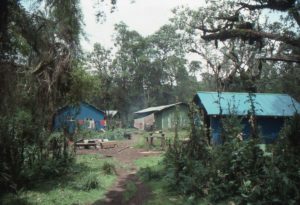 Karisoke began as a couple of tents in a forest clearing at 10,000ft (3,000m) in the saddle between two extinct volcanoes, Mount Visoke and Mount Karisimbi. By the time I arrived in 1976, it had grown to a cluster of corrugated iron cabins, each with a bed, a desk, a typewriter and a smoky wood-burning stove. Today, those cabins have gone and New Karisoke is a modern building in the nearby town of Musanze (formerly Ruhengeri) with laboratories, offices and this year, a public exhibition showing 50 years of research and conservation work. On this new virtual safari, we begin by joining the Geminder Family from Australia on a visit to the Titus Group, meeting descendants of the gorillas Dian Fossey began studying in 1967. Then we move to the peaceful glade near the site of the original Karisoke where Dian Fossey and a number of gorilla poacher victims are buried. Finally, we visit the 50th Anniversary exhibition in New Karisoke to learn about Dian’s extraordinary career. The Mountain Gorilla story is one of the few good news stories in conservation, with their numbers slowly recovering. What a wonderful, and — with your help! — lasting legacy. See www.4apes.com/species/gorilla for more information on gorillas and a list of organisations working for their survival. For more virtual gorilla safaris, click on the Take a tour tab above, or download the Apps, Gorilla Safari VR and Ape App VR. Would love be to volunteer. Is that possible? That lady is a hero of mine. What a great invention! This virtual safari is truly impressive as the immersion is thrilling. A great way to spark people’s interest and to educate everyone about wild gorillas from afar and the remarkable work done by the team on site.